Fancy color schemes, dazzling performance, unique designs and often a lot of media coverage, that's what jet prototypes are all about. Especially during the 60ies and 70ies US aircraft were the real show stoppers. Here are a few of my favorites. The F-15A is one of those aircraft for which no prototypes were made. Production started with a batch of Full Scale Development airframes, consisting of ten single seaters (71-0280 to 71-0289) and two more fitted with dual controls (71-0290 and 71-0291). Production style wing tips and tailplanes were retrofitted to the FSD airframes to cure buffeting and wing load problems, so doing a conversion to FSD is quite easy. Being LS's first ever 1/144 jet model, this kit is not flawless but is still miles ahead wrt shape and accuracy over the Otaki, Crown/Revell and Dragon kits (note that ARII reissued both the Otaki kit and the LS kit, the latter being labeled as 'F-15C' cat.nr.23005). the exhaust nozzles, these being over 1mm too long, making the nozzles stick out beyond the tailhook housing instead of lining up. the nose wheel leg is a bit short, this can be fixed by fitting a piece of plasticcard in the wheel well on which the leg is mounted. While you're at it, add those two round landing lights to the nose leg too! Whilst the nose leg is too short, the main gear legs are too tall, giving the model a funny nose-down attitude. The main legs can be shortened by cutting them flush off their attachment tabs, drilling a hole in each tab and inserting the leg into this hole. There is no cockpit interior whatsoever, so I added dash, coaming, floor, stick and seat from scratch. I added some of the ducting inside the main intakes, to get rid of the see-through effect. 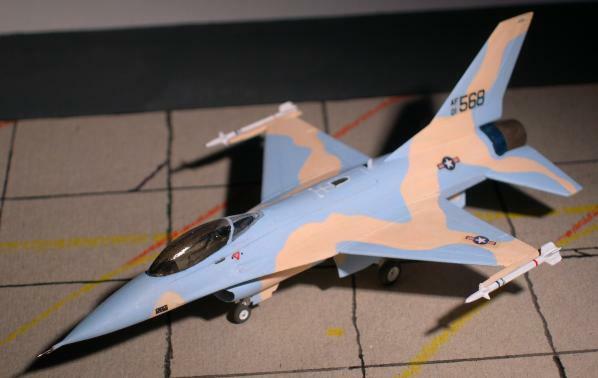 The model was finished in Polly-S 'Air Superiority Blue' FS.35450 with dayglow patches (Revell 25 with a touch of red over a flat white base coat). 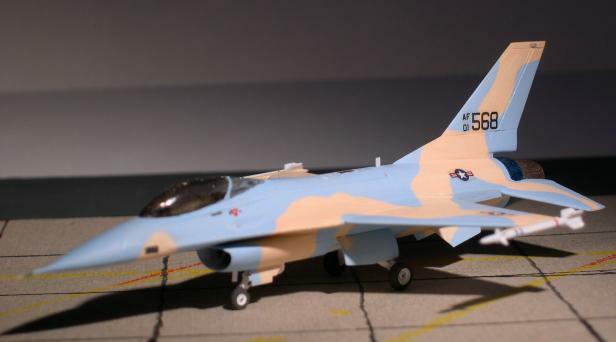 Decals came from a Revell/Crown F-15 kit, which happened to have the serials for the 6th FSD airframe added to a corner of the sheet. Borders around the wing insignia were painted by hand. Date finished: August 26, 1983. 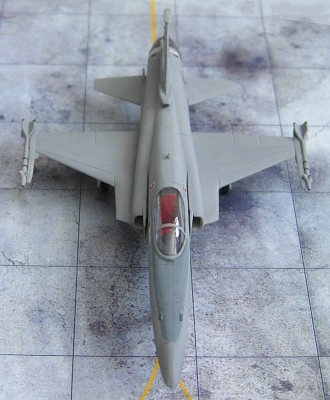 The Crown F-16A kit, which was also reboxed by Revell Germany (cat.nr.4006) and later released by Minicraft (cat.nr.4424), is in fact based on the YF-16 design, but was retooled to match F-16A dimensions. The way this was done, makes it easy to convert the kit back into a YF-16 prototype. The model depicts the 2nd prototype in experimental "Sky & Clouds" camouflage. For the blue (Air Superiority Blue FS.35450) I used Polly-S PCA800. For the 'clouds' color I mixed Humbrol paint to match Ford Motor Cy. 'Wimbledon White', which was allegedly used on the real airframe. The tiny insignia decals came from the USMC section of a Crown Harrier sheet, the tail registration numbers and service markings were either taken from my spares box or hand painted, the aerial refueling aiming mark on the spine was also hand painted. flattened the underside of the nose. added pitot support and forked tube to nose tip. moved the gun muzzle back. cut the nose wheel gear door into three pieces. cut off the wing tip missile launch rails, shorten the wing tips. cut 1mm off the trailing edges of the wings. reapplied wing tip launch rails. replaced ventral fins with smaller, longer ones. sanded down the tip of the vertical tail fin. increased outer diameter of engine exhaust near the fuselage. finally, added a blade aerial to the fuselage spine between the refueling receptacle and the tail fin and another one under the intake in front of the nose wheel bay. Date finished: February 12, 1984. 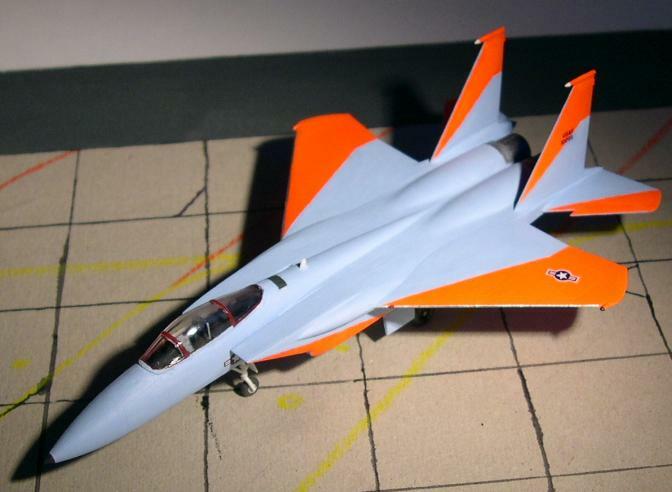 LS made a beautiful little kit of the F-20 (kit 1053), this kit is currently available from ARII/MicroAce. There are also some pirated copies of this kit around, one of these even ended up in the Airfix catalog (kit 00103). 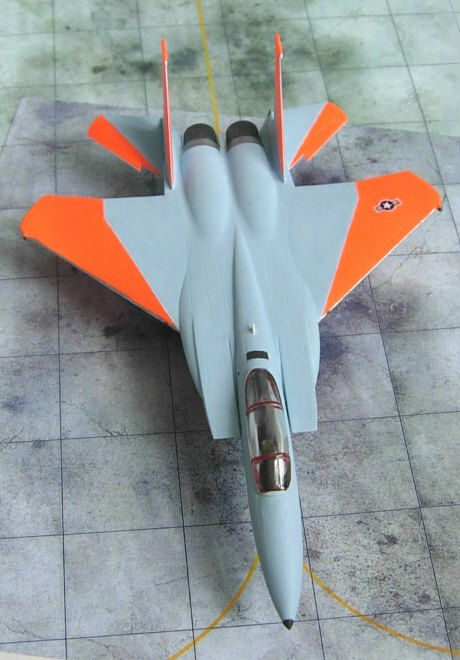 The LS kit features the shark-nose design and the late style canopy with enlarged clear area, so a 2nd or 3rd pre-production F-20 can be made straight out of the box (the 1st F-20 was built as an F-5G using the nose section of an F-5E: narrower forward nose section, different canopy). LS got every detail right apart from the position of the vertical tail fin: the initial F-5G design had its fin further forward than the F-20, the LS kit has the fin at the same location as the F-5G design had. The LS decal sheet offers two options, both in the same two-tone light gray scheme: the first is for 1st PP F-20 serial 20062 with USAF insignia on the wings and intakes, the second is for 2nd PP F-20 with civilian registration N3986B and no USAF insignia, both schemes include the 'F-20' and 'F-20 Tigershark' legends for tail fin and nose. Note that only the second decal option can be used on the kit without modifying the nose section and canopy. the vertical tail fin needs to be cut off along the top of the fuselage and moved back by 1.5mm. the nose wheel leg is 1mm too short, this can be fixed by fitting a piece of plasticcard in the wheel well on which the leg is mounted. due to the way the fuselage halves are molded, the top of the gun barrels are flush with the nose, the look can be improved by cutting a small v-shaped grove on the inside of each barrel, with one side of the V-shape flush with the nose and the other one vertical against the barrel. 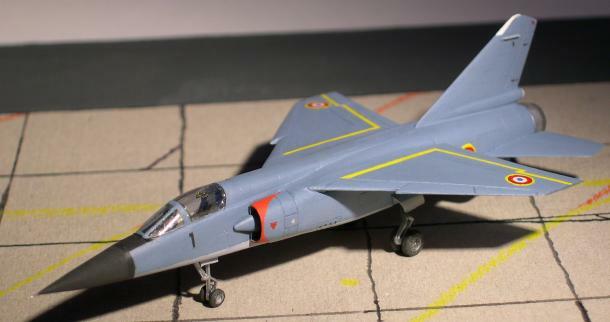 The model was painted with Tamiya Acrylics mixed to match FS.36375 with FS.36495 underside (both mixes based on XF-19 Sky Gray) and FS.35237 anti-glare panel on the nose (basically the same color scheme as an early F/A-18). Decals came from the LS kit, I painted the anti-glare panel by hand instead of using the decal supplied. Date finished: August 18, 1985. 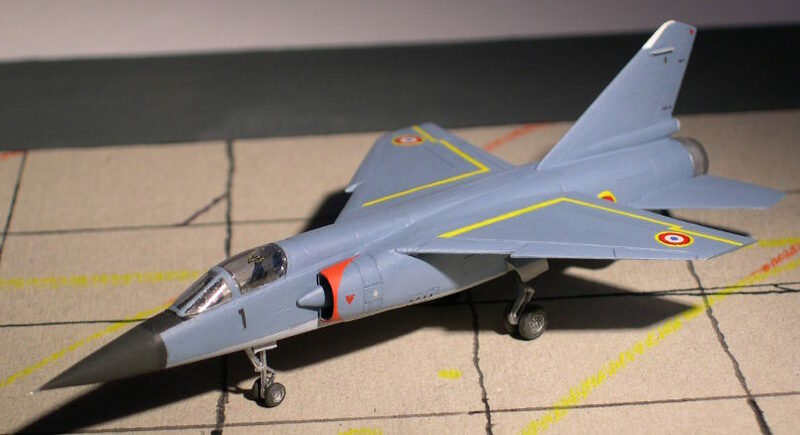 Okay, this one isn't as flashy as the previous ones on this page, but it is an interesting kit of an interesting aircraft (it was afterall the F-16's main rival in NATO's F-104G Starfighter replacement contest). This is the Crown kit (also available from Revell Germany and Minicraft). replace the thick wings with new ones cut from 1.5mm plasticard. sand the tail surfaces down to credible thickness. reshape the nose, making the cross sections circular from the tip of the radome to the base of the windshield. add splitter plates between the fuselage and the main air intakes. add antennae to tail fin. The colors were mixed, a mix of flat gray and aluminum for the lower sides, a mix of blue and gray for the top color. Apart from the roundels, all markings were painted by hand. Date finished: January 22, 1984.